This 2018/2019 edition has undergone a major revision and will be invaluable if you are prepared to sell a portion of the ownership in your business in return for money. This book shows you how to finance business growth by selling a piece of the pie. Find out what’s involved in selling shares to the public in an Initial Public Offering (IPO). It covers the types of shares that are publicly traded and the preparations for going public. This book reviews all the Canadian exchanges. It covers the listing requirements for the Toronto Stock Exchange (TSX), the Toronto Venture Exchange (TSXV) and the Canadian Stock Exchange (CSE). It includes a section on private placements and on stock options as they relate to the Toronto Venture Exchange. It also covers London’s Alternative Investment Market (AIM) and listing on the NASDAQ exchange in the U.S. It also points out the advantages together with the disadvantages of being publicly listed. Learn how employee share ownership plans work and how they can be used to raise capital; together with the advantages and disadvantages. Find out how some of the provincial governments can help. Take a look at franchising as a method for financing growth. Consider some of the factors that you will need to take into account. This book is essential reading if you are an entrepreneur or business owner who wants your company to grow by giving up part of the ownership. Iain spent five years as a financial analyst in the stockbrokerage business and knows the underwriting process. For fourteen years he operated his own businesses in importing, high technology and manufacturing. He now operates Entrepreneurial Business Consultants of Canada and also owns a book publishing business. He holds degrees from Oxford University and from St. Andrew’s, Scotland. 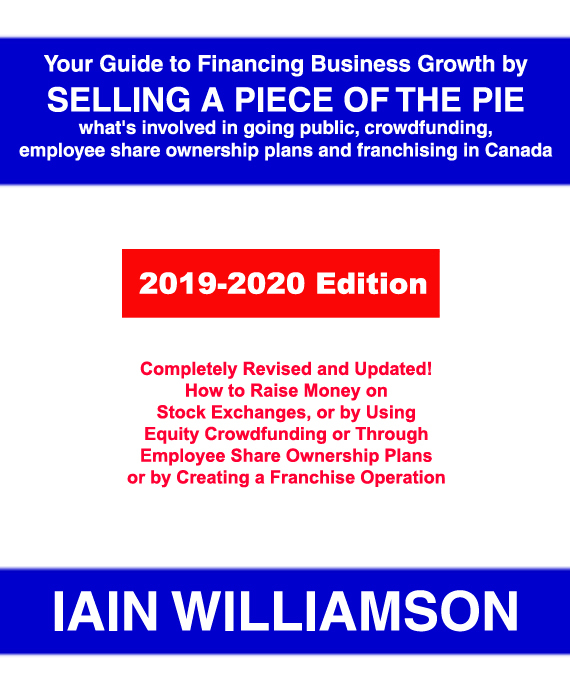 Your Guide to Financing Business Growth by Selling a Piece of the Pie: What's involved in going public; crowdfunding; employee share ownership plans and franchising in Canada: 2018-2019 Edition; by Iain Williamson; 228 pages; softcover; ISBN 978-1-55270-800-2; ISSN 1191-0488; published in August 2018; Canadian $74.95. The Meaning of "Going Public"
How Large Does A Company Have to Be to Go Public? Short Covering Rallies and a "Short Squeeze"
Are Shares Available to be Borrowed? Why Don't Some Marriages Make it to the Alter? How Do Small Business Owners Use the Money? Accredited Investors in the U.S. Dwindling Number of Accredited Angel Investors in the U.S.
CHAPTER 17 Is Franchising for You?